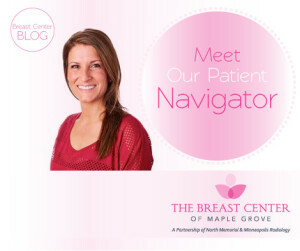 Meet our Patient Navigator, Tracy Fisher! This month, we’re delighted to introduce you to Tracy Fisher. A veteran in the field, Tracy has worked in women’s healthcare for over 15 years and is a Certified Breast Patient Navigator (BPN, CN-BC). Tracy has worked with our group since 2007 and plays a very important role at BCMG. The Breast Center of Maple Grove offers a wide array of breast screening and diagnostic exams. While most screening exams will be completely normal, sometimes an abnormality is present, which requires additional imaging and possibly a biopsy. That’s where Tracy comes in. Patients facing diagnostic procedures have many questions and are often understandably nervous about what comes next. In her role as Patient Navigator, Tracy helps patients understand their exams and treatments, answers their questions and provides support throughout the process. There isn’t one! As a complement to our expert team of technologists and physicians, Tracy works closely with different patients, each with unique needs and concerns, every day. When asked what she likes most about her job, Tracy says, “I like being able to help patients through a stressful time. I am here for patients throughout their entire experience at the breast center – whether they need help finding resources to understand their condition or just someone to hold their hand, I’ll be there for them.” When not accompanying a patient in an exam, she can usually be found returning patient phone calls or emails. Tracy likes to spend time with her two awesome sons, one amazing husband and two dogs, who are often treated like children. She likes traveling, camping, fishing, road trips, snowmobiling, reading and DIY home improvement projects. We want to create the best experience for our patients and their families. In addition to the support of the Patient Navigator, BCMG delivers a relaxing and comfortable environment that recently underwent a major face-lift. Our expert team of technologists and physicians will go the extra mile to ensure our patients are comfortable and the best possible images are obtained. For the convenience of our patients, we offer same-day results and appointments and can also accommodate walk-ins. To learn more or schedule an appointment, please contact us at 763-398-6370 or complete a mammogram contact form.